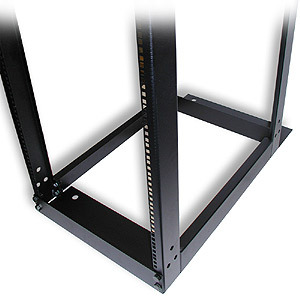 Servit™ 6-Series/12-Series 19" 4-post open racks, constructed of heavy duty steel and rated at 1000 lbs. (1500 lbs. when networked), are a cost effective solution for rack-mounting servers and other 19" EIA network equipment. Servit6-Series/12-Series are 4-post open racks, designed to meet the most stringent requirements for rack-mounting servers of any brand and any data/communication equipment along with 4-post shelves and accessories. When you're looking to bring costs down, and when limiting access to any individual rack is not a security requirement, Servit6-Series/12-Series is the perfect alternative to the more expensive enclosed racks. With cable-management in mind, Servit6-Series/12-Series are designed for either a stand-alone setup or for multiple-rack data-center installation, with available support for extensive cable management by integrating Inter-Bay Vertical Troughs in between the networked Servit™ racks. Servit™ 6-Series feature steel-constructed rails with square holes for use with cage-nuts. Servit™ 12-Series feature alluminum-constructed rails with pre-tapped #12-24 holes. Servit6-Series/12-Series can also be networked with Standard Relay Racks and supports integrated PDUs. Servit6-Series/12-Series can be ordered at 84" high (45U), providing front and rear mounting support for rack-mount servers, in four (4) available depths ranging from 24" to 36". 29-inch-deep Servit 1229 are also available in heights as short as 36" (18U); as tall as 108" (59U)*. * Special order, with a 10-12 business-day production lead time before shipping.